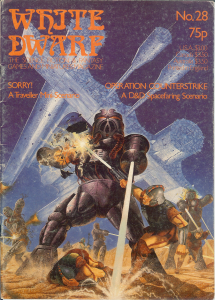 White Dwarf 28, dated December 1981/January 1982, contains the usual columns supporting D&D/AD&D and Traveller, with news reviews and one general article, The Magic Jar by Andy Slack, on how to convert characters from one system to another. The Magic Jar is the first article I recall which discusses system conversion – I don’t think I had the DMG at this stage, and since I only had two radically different games, Moldvay D&D and Traveller, I saw little point in it at the time. With hindsight, it takes on greater import. There was an explosion of systems around ’81/’82, and we were still very much finding our way with the hobby. Slack’s reasons for the article are stated at the beginning: a number of people are changing the games systems for their campaigns (his example is a D&D GM wanting to switch to Runequest or Chivalry & Sorcery); GMs may want to bring a particular monster from one game to another; players may want to convert a favourite character; or a GM might want to use the setting of a different game system as a different plane. Slack’s method – analysing the statistical chance of stats, and finding an equivalent – was reasonably sound, and he bases his estimate of a character’s level around his ability to hit AC10 (an unarmoured opponent in the D&D of the day). It’s also fairly typical of its day, relying on tables showing the probabilities of particular rolls for common dice sets (I think I can still recall the percentage distribution of 3d6 by heart). These days, the reason I’d particularly want to do a conversion is if I have a published setting I want to use with a different system (using ICE’s MERP modules with Hero System for example), or converting a monster such as the Umber Hulk to another system. My method relies far more on feel and the challenge I want the creature to give the PCs than maths, though – in other words, I’d wing it. But back in the day, I recall people converting their homegrown campaigns from one rules system to another, players converting characters and, particularly, planar travel. Planar travel seemed core to the AD&D experience in particular, and there was relatively little guidance on what it meant, never mind how to do it. Several scenarios, both official and unofficial, required or offered it (for example, Q1 The Queen of the Demonweb Pits, or the White Dwarf D&D scenario The Halls of Tizun Thane), the PHB had that classic picture of the paladin in Hell, and the cover of the DMG featured a party battling an efreet on the Elemental Plane of Fire (this is not readily apparent on the front cover commonly shown onlione – the picture is a wraparound onto the back, so if you’ve never held a copy of the 1st edition DMG you may not realise it). In the absence of any details, foraging a new plane from a different game system wasn’t uncommon. By contrast, if you came across something you liked for your chosen game system, it generally got plugged into your campaign’s regular Prime Material plane without a second thought – who cared about consistency when we had fun and coolness to think about. I recall our D&D characters heading to the Wild West (Boot Hill) and to Gamma World (both those were in the DMG, so that was downright canonical). But our biggest use for planar travel was probably moving characters between one DM’s game and another. It was almost assumed in my circle of gaming friends that this could happen and that, somehow, the planes were involved (if you needed any justificaton at all). Also in WD28 was On Target, a feature by Stephen Cook offering a hit location system for Traveller, which went into the ridiculous level of detail (and number of tables) beloved of a certain style of gaming in those days. First you rolled on a table to work out if the shot hit torse, head or limb, then on a subtable to work out exactly where the shot hit. It’s worth pointing out that there was a distinct school of old-school gaming which valued complexity as the key to realism. The modern OSR movement, championing Holmes and Moldvay, feels to me as much a reaction against Chivalry & Sorcery, Aftermath! and articles like On Target as it does an attempt to recapture the simple joys of youthful gaming. OSR is fighting battles in a war that’s been running since the dawn of our hobby (remember, Tunnels and Trolls, the second RPG, began as a reaction to OD&D’s perceived illogicality and complexity). There’s also a report of London’s Games Day ’81 convention, which I think was the premier UK convention of the day, and I think was Games Workshop’s baby. Transatlantic guests of honour included a bearded Marc W. Miller representing GDW, who gave seminars on “Basic and Advanced Traveller”, and Mike Stackpole and Liz Danforth representing Flying Buffalo, who ran Tunnels & Trolls games. The report notes that 7,000 punters and 40 games companies attened the two-day event (September 26 and 27, for those who like dates). The awards for Best Game went to D&D (1st), Traveller (2nd) and RuneQuest (3rd), while Best Wargame went to Diplomacy (1st), Kingmaker (2nd) and Squad Leader (3rd) – notable that these are all self-contained boardgames using counters rather than minis. Best Family Game was Monopoly, Best Abstract Game was the Rubik’s Cube, and Best Electronic Games were Battlezone (1st), Asteroids (2nd) and my beloved Galaxians (3rd). The report also notes that the BBC sent a camera crew to record events on the Sunday for a documentary entitled Games People Played. TV coverage? Yeah, this was the definitely the cusp of the RPG explosion. I’ve not found any record of this online. Games of Liverpool’s ad in WD28 now includes the address of its new branch in the Merrion Centre, Leeds, which was my first Friendly Local Games Shop – at a brisk walk I could make it down to Games and back in my school lunchtime with enough time to spend about 20 minutes browsing the collection of strange and wonderful RPG titles in the downstairs (basement) section. There’s also an ad for Treasure Trap, one of the world’s first LARPs, but that’s probably worth a post of its own. The Magic Jar by Andy Slack: converting characters from one RPG to another. Operation Counterstrike by Marcus L Rowland: an interplanetary AD&D adventure. On Target by Stephen Cook: a hit ocation system for Traveller. 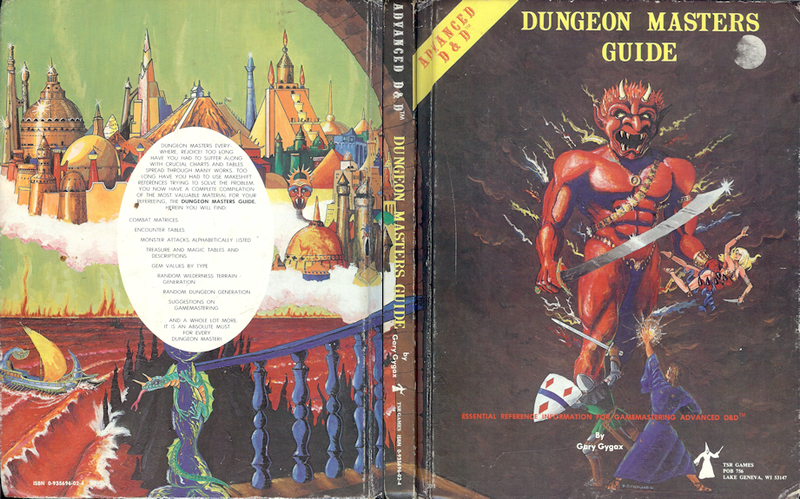 Games Day ’81 by Ian Livingstone: convention report. Character Conjuring: War Smiths, an AD&D fighter subclass by Jamie Thomson. Treasure Chest: D&D/AD&D magic items. Fiend Factory: Out of the Woods – forest monsters for D&D/AD&D. This entry was posted in Gaming and tagged AD&D, old school, tabletop, White Dwarf. Bookmark the permalink. My copy o the AD&D books were lent to someone, who then disappeared. I do remember getting my AD&D books piecemeal. At nearly £9 a throw, they were somewhat pricey. My first AD&D book was a softcover PHB I bought from a kid at school who’d jusy got a hardback. I got the DMG new to go along with it. I didn’t have the Monster Manual for ages, but relied on the plain stats in the back of the DMG.